Young Israel of West Rogers Park (chicago) presents MUSIC CAFE. 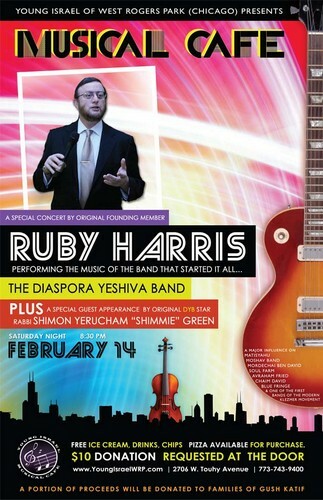 A special concert by original founding member RUBY HARRIS performing the music of the band that started it all… THE DIASPORA YESHIVA BAND. Plus a special guest appearance by original DYB star Rabbi Shimon Yerucham “shimmie” Green. Saturday night February 14th, 2009 @ 8:30pm. FREE Ice Cream, Drinks, Chips. Pizza available for purchase. $10 Donation requested at the door. 2706 W. Touhy Avenue. For more please visit YoungIsraelWRP.com or call 773-743-9400. A portion of proceeds will be donated to families of Gush Katif.